Kirby definitely fits the bill of a “quick-change artist,” not just due to his ability-stealing talents providing variety and fun, but because Nintendo often molds the amorphous puffball into new gameplay scenarios all the time. Amidst the Pinball Lands, Block Balls, Star Stackers, Avalanches, Dream Courses, Tilt n’ Tumbles, Air Rides, Mass Attacks, and even Epic Yarns, though, it’s nice to get a traditional Kirby adventure once in awhile. That's exactly what Kirby's Return to Dream Land is, and it’s pretty long overdue (being the first traditional console Kirby game since 2000’s Kirby 64). Even more important than that, to me, is the long-awaited return of multiple moves per ability. This novel addition first showed up in the amazing Kirby Super Star for the SNES, a fan-favorite title that—due to its greatly varied and fun gameplay, large, colorful graphics, and majestic soundtrack—elevated the series to the next level. So while we’ve already gotten games like Squeak Squad and Amazing Mirror, none of them have had the same feel as Super Star due to the lack of multi-move abilities. Really, the game plays like a Super Smash Bros. platformer. KRtDL essentially has the stage design and progression of Kirby’s Adventure, and the movesets of Super Star. Kirby (and Co., if applicable!) travels through a number of themed worlds, each with a handful of stages culminating in a boss tussle. 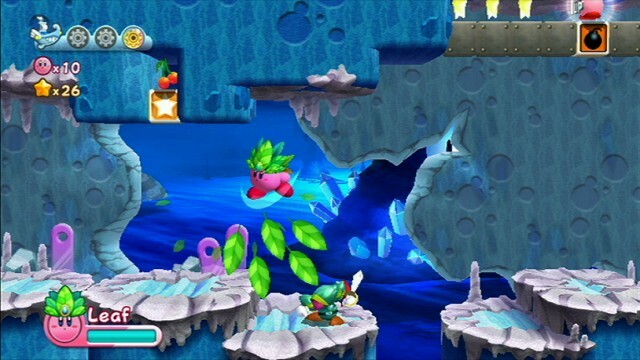 Within the stages, there are baddies to slay, platforms to navigate, and the usual star block and ability-based minor puzzles to seek out each stage’s Energy Spheres (120 in total). These smaller puzzle elements go a long way to add that little extra punch to the otherwise linear levels, and the Energy Sphere collection ends up feeling a lot like the NSMB games’ Star Coins. The new leaf ability is a highlight! In all honesty, the stages are actually pretty basic. Beyond the audio/visual upgrade, there’s not much done here that couldn’t be (or hasn’t been) done in past Kirby games. The good news is that they’re still a joy to play through, quite varied in and of themselves (nearly all of them have multiple sections, songs, and environments), and they cram in an appropriately large number of enemies for such an action-driven game. On that note, the abilities are handled wonderfully. Like Super Star, this game is absolutely about battling as much as it’s about platforming. Every one of the game’s 20 standard abilities has at least four or five moves (with some having over ten! ), each with their own unique animation and properties. It’s actually pretty incredible when you realize it essentially boils down to 20+ unique playable characters—just under the guise of Kirby’s various costumes—and it makes the game’s pace every bit as varied as it sounds. Some moves, like Stone, Needle and Tornado, have gotten additional attacks that help speed them up and give them needed variety, while other abilities, like Ninja and Fighter, get even more skills added to an already extensive list. There’re ample abilities and plenty of opportunities to switch them in the game, and it really never gets old because of the variety and freedom of choice. 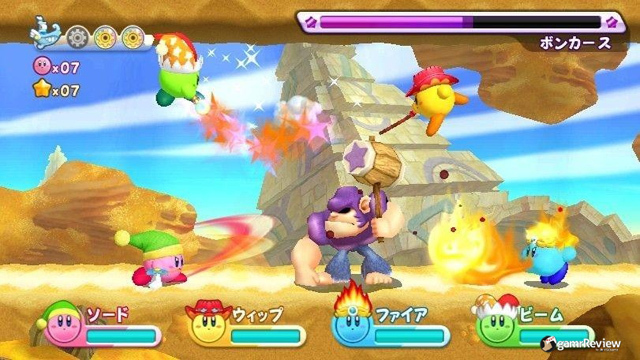 There are also a few Super Abilities, which result in Kirby wielding an enormous weapon to tear up the stage. These show up sparingly enough to be enjoyable, and there are often minor puzzle elements involved with these superweapons as well; when you destroy a certain part of the environment, you’ll open up a wormhole to a black-and-white “void” stage where a wall of doom chases you to the end. It’s quite frantic and adds a nice bit of variety. 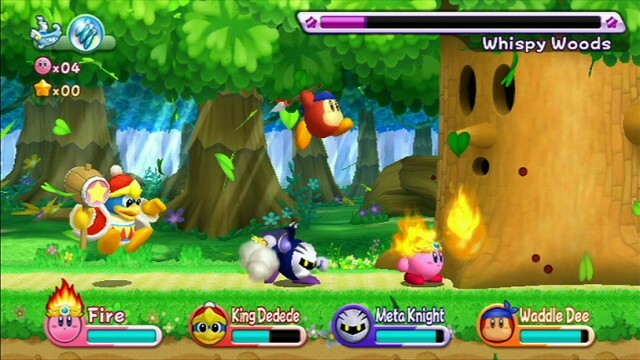 The multiplayer is also a hoot, with up to three other players being able to choose between any of the four characters (you can have multiple Kirbys, but not more than one Dedede, Meta Knight, or Waddle Dee). It’s much less intrusive/combative than NSMBW and Four Swords, with most party interactions being minor. It’s definitely worth trying out if you’ve got gamer friends, and due to the simplicity of the game mixed with the fun of the abilities, I’d say it’s absolutely one of those “bridge titles” that Nintendo likes so much. So you're often using your stylus to keep track of all your Kirbys, and...oh wait. Return to Dream Land is a nice-looking game, but rarely a beautiful one. The polygonal characters just seem a little more sterile to me than a lot of the sprite work from games’ past, but it certainly still gets the job done (and the animations—particularly Dedede’s—really add to the charm). The music is similarly pleasant, with a handful of stand out tunes and a number of solid remixes. It’s not among my favorite Kirby soundtracks, but it’s solid and rather extensive in the number of songs. The sound effects deserve special mention—they’re appropriately punchy, crunchy and violent, and really give some oomph to Kirby’s attacks! I do wish there was a way to adjust the volume levels separately since the music is a tad soft for my tastes. KRtDL, in series' fashion, is an easy game. But in Nintendo fashion, there’re plenty of challenges to tackle mid and post-game that bring in the hurt. Among these are seven Copy Ability Challenge Rooms, which have you running through a 2-minute stage, attempting to kill everything and grab all the pickups before time runs out. Depending on your performance, you'll get one of 4 different medals, and the highest ranking is very difficult to achieve! It’s definitely on the level of DKCR’s Shiny Gold medals, actually (although there are much less of them here than in DKCR). There are also some unlockable minigames, including a particularly cool one post-game, and even an extra mode that adds some longevity. The main game is somewhat on the short side, a bit briefer than games like NSMBW and DKCR, but to fully 100% the title will definitely take some game time (15-20 hours, I’d wager). Some areas require the use of certain abilities to nab goodies. So what don’t I like? Frankly, I feel that the game lacks a little ambition. The best Kirby games—Kirby’s Adventure and Kirby Super Star—really pushed the platforming genre to its limit, introducing awesome new concepts and wrapping them up in the best game possible. Ignoring the tech, KRtDL doesn’t really do much that hasn’t or couldn’t be done on the GameCube, or even N64 and SNES. It plays like an extension of Adventure with Super Star’s moves, and while that results in a very strong game, it does feel pretty safe overall. So in that way, it’s a little disappointing that it couldn’t go the extra mile to really set a standard. 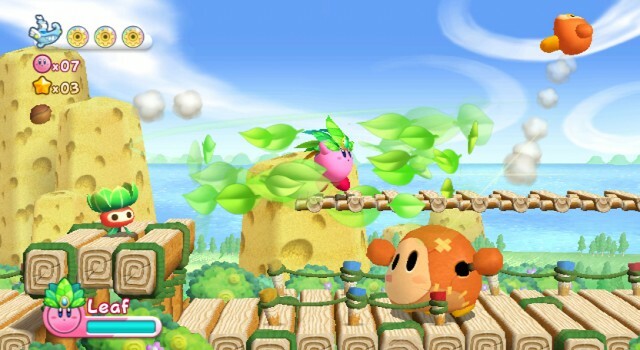 All in all, though, it’s a quintessential Kirby game—fun, varied, adorable, and with plenty of hidden depth. It’s pure Nintendo, and whether you’re flying solo or with pals, the game remains enjoyable to the end and beyond. OoT 3D to include Master Quest! Great review. I've only put an hour or so into this game so far but I really, REALLY enjoy it. I'm going to try and have it finished by the time Skyward Sword hits in TWELVE days!!! I'll wait for someone who knows a thing or two about Kirby to review the game. TriforceBun, just wanted to let you know you can submit your Kirby review using the review system set up in the game database. For Kirby's Return to Dream Land, scroll down to the bottom of this page and look for the "Add a Review." Thanks for the review. I haven't bought this game (yet) as I'm hoping to get it for Christmas. Skyward Sword will likely keep me occupied until then, and my brother-in-law and I always love a good multiplayer romp. Yeah, I can definitely see this being a good Christmas game for Nintendo fans who're nabbing the biggest titles (like Zelda) at launch. It's thoroughly pleasant and works really well with other players. Good to know. I'm a huge Kirby fan (looking forward to buying the 3D Classics update of Kirby's Adventure when it comes out, and this will be the fourth different time that I've bought it) and I adored Kirby's Epic Yarn when I got it last Christmas, and it was a pleasure to 100% (albeit a bit on the easy side). I'm definitely looking forward to the challenge! Perhaps I'll put it on my list. If you've heard the latest podcast, I'm a bit skeptical but open to experiencing it. Serious reply this time: Great review! Very thorough. I didn’t know about the number of medals you can get for the challenges. I’m a bit distraught over it, actually, because it was quite hard to get the 2nd best! I really can’t praise the animation enough. I know you are not overly impressed with the graphics here and mentioned the animation as a saving grace, but my god, the attention to details is amazing. And while I get the preference for sprites, had the game been sprite-based, then each transformation would have required its own animation, and as a result we would have most probably gotten less of it. I think compromise is worth it, if it means that we wouldn’t have seen Kirby fall flat on his face and pick himself back up so splendidly in a sprite-based game. Haven't you only played the very first game? You should try this one out, especially if you have a person or two to play with ya. Great review, TBun! I would probably give it an 8-8.5. Trish and I have been having loads of fun with it, but I know I wouldn't be enjoying it as much on my own. I really enjoy the animations too. I always look forward the the "long" Kirby/Dedede/Meta Knight/Waddle Dee dance when both Trish and I make it to "1" at the end of the stages. Great review T-Bun, and yes, it's been long overdue for a traditional console Kirby game (and the last original handheld one, Squeak Squad, left a bit to be desired). Being a big Kirby fan, I can definitely say I want to buy this game. It's awesome that you mention the challenges the game brings forth in Nintendo fashion. The fact you compare some of the challenge to the incredibly difficult DKCR's Shiny Gold medals makes me sweat with fear, haha. I love the fact there are 120 Energy Spheres. My my, Nintendo loves that number, Super Mario 64 set the standard it seems. I plan to pick this up later on, along with Mass Attack! This is just one of those times I wish Nintendo had something like Steam, haha. I think this looks like a good romp for a day or two, but I don't know if I want to spend over $20 to play something like this. Not because I don't think it's worth that much or because it's a kiddy game, but because I personally wouldn't pay a lot to play through the game. Great review, I pretty much agree with everything, though I left the game a little more lukewarm than you did. It was a worthy rental and I'm sure it's a blast in multiplayer, especially considering you can eat and grief each other, I assume. I also wasn't aware of that thing with the four things. I would have tried a little harder had I known there were more than three things. Those things were probably my favorite part of the thing. Also, I liked how the unlockable mode (Extra Mode) had tougher bosses with new attacks and forms) and that the final unlockable mode (True Arena) had an extra little surprise in it as well (Galacta Knight boss fight). It wasn't much, but it was enough to make going for 100% feel a little more worthwhile. Sounds great. I picked this up on the Amazon B2G1F sale, along with Dark Souls and Wii Play Motion. Kirby alone remains unopened. I think I'll save it to play with my nephews. Hey, I actually opened the other two! That's real progress for me, man! I was uncharacteristically eager to try Dark Souls and Wii Play Motion. I also got 6 more games, which are all still sealed. Now THAT is classic Anand. Proper reply: Thanks for the review! I haven't been able to get mine in yet. I have been playing quite a bit of the game, though. It's actually one of my favorite side-scrolling games on the Wii (still far behind DKCR, though). The only "problem" I found, beyond the fact that the game screams simplicity, is that I tend to abuse some power-ups and I have to force myself to try out new ones. Yeah, everyone has some favorites! Fortunately, a couple of my favorites show up pretty late, so I had a lot of time to get acquainted with everything else. Great review @TriforceBun! I especially loved the intro. I think the game looks great, at least in stills. I have to see it action to see what you mean about the graphics. I'm ashamed to say that I've only completed one Kirby game, the first one. This one looks like something I might be interested in. WOOO Kirby! It's funny but some of my friends who don't play the Wii outside of Smash Bros, are actually more interested in Kirby's Return to Dreamland, than Zelda Skyward Sword. I told them I'll be picking it up and they can't wait to play some multiplayer. My girlfriend is also gonna go nuts for this game. Thanks for touching on the multiplayer in your review, it sounds quite fun. It's a major reason I'm excited to receive this game as a holiday gift. Actually I have a couple questions: does the game scale to how many players there are? Like, more enemies, etc...Also is the game actually tougher in multiplayer, like NSMB Wii? Is there collision between characters on screen? Great review! I originally wasn't planning on picking this one up because I'm not really into Kirby, but your review made me think otherwise! (Oh, GelatinousEncore has a good review here too, so I'll comment there as well). Cool, I just 100%'ed the Normal Game (beat the game with all 120 Energy Spheres and got bronze or better on the Challenge Rooms, and also beat Arena) and started playing a little bit of the Extra mode. Now it's getting tough! All around it's another excellent Kirby Adventure game. On that note, the abilities are handled wonderfully. I definitely agree with this, Kirby is a lean, mean fighting machine, and you have such a great variety of attacks at your disposal. The Challenge Rooms, of course, exploit this to the fullest. In fact, there were quite a few surprises about some of the moves I didn't even know Kirby could pull off! And yeah, the Super Abilities are a fun addition. Kirby is just too cool wielding the Ultra Sword (especially using it near the end of the game… epic! ).